In the US, legal drinking age is 21. Please drink responsibly. In front of the barrel pyramid at Bulleit, wearing an Alice Riot skirt. 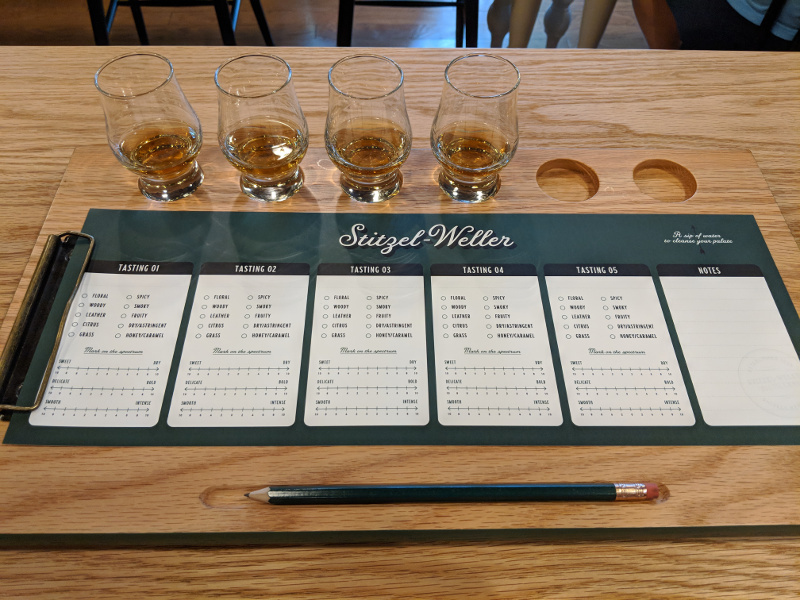 One of the brands I was very familiar with before the trip, Bulleit Frontier Whiskey’s visitor center is at the historic Stitzel-Weller Distillery, southwest of downtown Louisville. The visitor center was part museum and part gift shop. Display cases and rooms containing artifacts and photo ops were open for browsing while waiting for the tour to begin. They also had complimentary coffee and water in the waiting room. Cheesin' in Tom Bulleit's office. 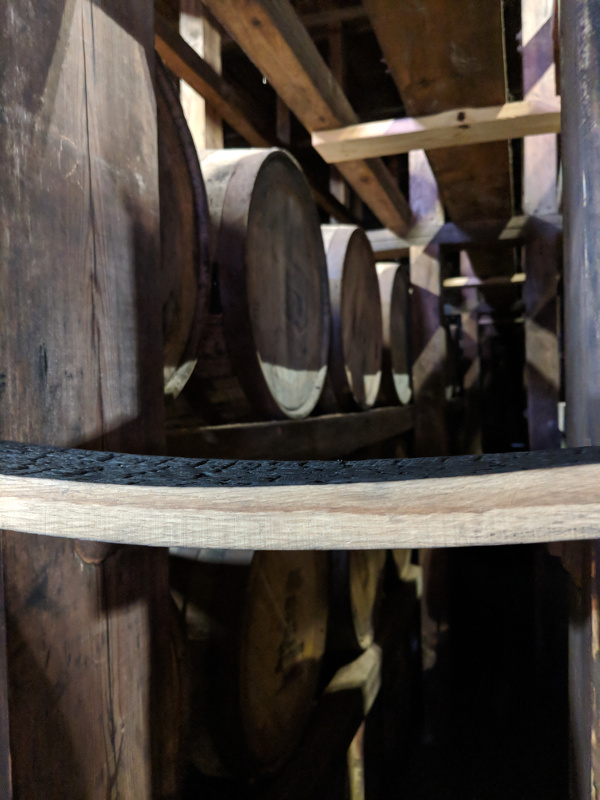 Our tour guide used to work at a cooperage and offered insight on barrels. Back in the day, "rick racks" were distillery workers who would scale rickhouses looking for leaky barrels. Distilleries had an on-site cooper shop where the leaky barrels were repaired. The red line shows how deep the aging bourbon pushed. The tasting notes sheet was a nice touch, as were the heavy-handed pours. Sips included Bulleit Bourbon, Bulleit Rye, I.W. Harper, and Blade and Bow. I was pleasantly surprised by the Blade and Bow, a little spicier than most bourbons I like, but smoother. That plus it's unique history led to me buying a bottle, but I don’t think I will track down another once it is gone. Cool gift shop find from Brackish Bowties. 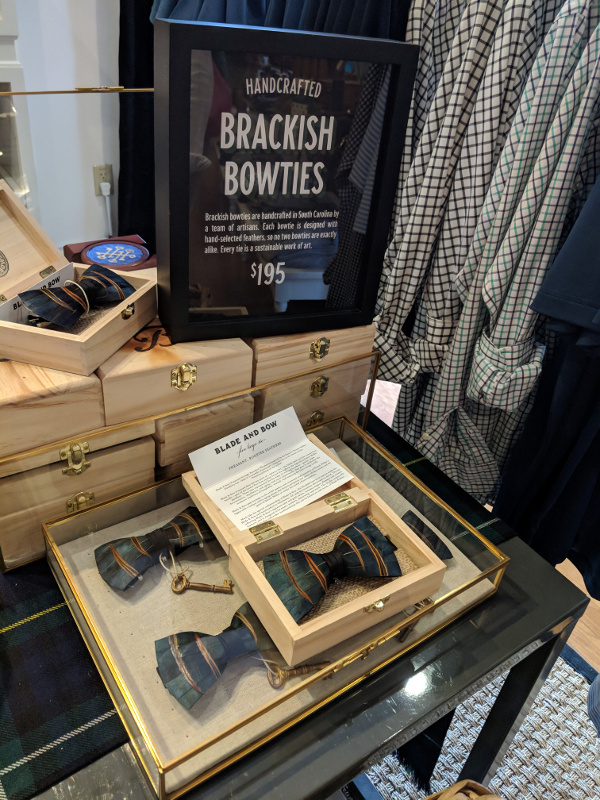 Blade and Bow inspired many of the offerings in the gift shop, including a special edition bow tie. 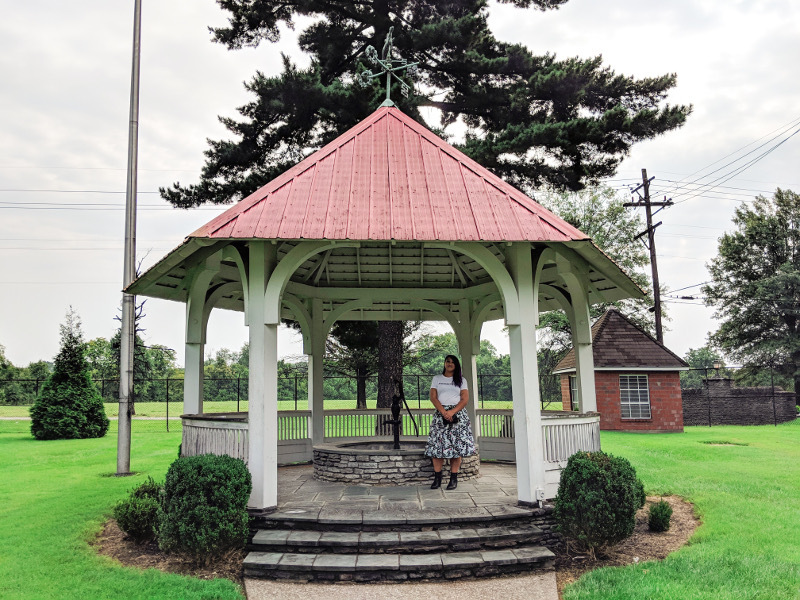 The grounds were beautiful and while I appreciate history and historical architecture, the focus seemed a little reliant on Stitzel-Weller’s story. Bulleit is working on opening a visitor center at their main facility and I am looking forward to checking it out and seeing how the tour narrative changes. My first experience with Angel’s Envy was at the MartinPatrick3 Ice Bar in February, only months before the trip. Bourbon, neat, was the most appealing thing on the menu and I’m glad I went for a newer brand. The Angel's Envy tour ticket is the most expensive on the Trail and one of the few that did not allow walk-ins. At first, I was a little turned off by this. After checking in, they offered complimentary boxed water. This was also a little conflicting. Water is great for a walking tour with alcohol and premium water fits with their premium branding, but I was still salty over the higher ticket price. Outside the quality and testing lab at Angel’s Envy. The entire facility is lovely though and meshed well with the Angel’s Envy brand. The urban setting and relatively compact site possibly added to the higher price and strict tour ticketing practices. The spirit safe was the most attractive on the trail and was even capped with a special Louisville touch. Spirit safe is topped with a Louisville Slugger cap. Angel’s Envy is unique for it’s finishing process - their bourbon is finished in port wine barrels before being bottled and sold. The tasting room was beautiful and modern. I also had the most fun at the Angel’s Envy tasting! While not the only time chocolate and bourbon were paired on the trail, Angel’s Envy had integrated the chocolate the best and had quite a healthy pour. The tasting room opened up into a bar where more beverages can be purchased after the included tasting. There were even complimentary jars of bar snacks on the tables. Another fun thing in the tasting room is the scroll wall - rather than comment cards, comment scrolls can be added to the wall. KBT Tip: Angel’s Envy does not allow walk-ins for tours, prior registration is required. The “Bourbon Experience” is definitely a descriptive name. The experience started off with a video and moved into different rooms with different themes. I appreciated the background on Kentucky history not touched upon in other tours. It was also nice to learn more about the importance of the Bottled-in-Bond Act of 1897 in its time. 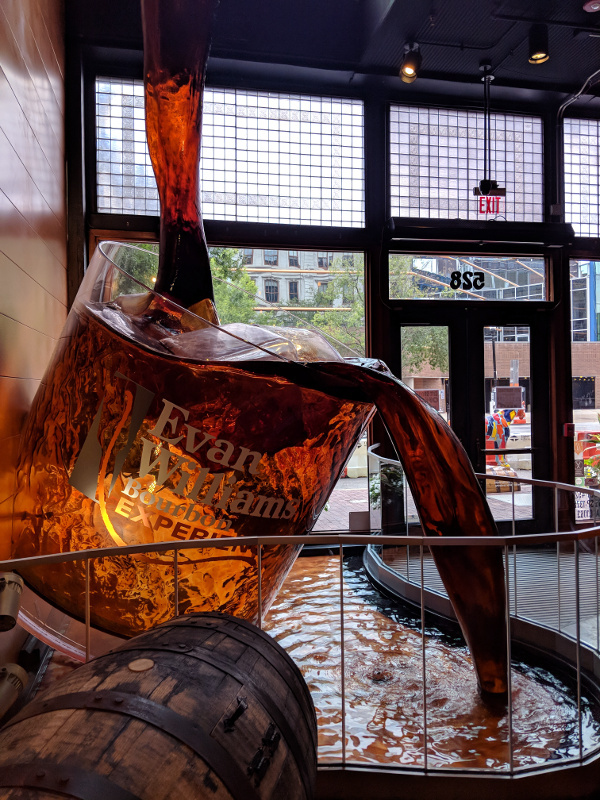 I probably would have visited Evan Williams earlier in the trip - the theme park like videos and rooms did not seem aimed at bourbon enthusiasts, but the public in general. 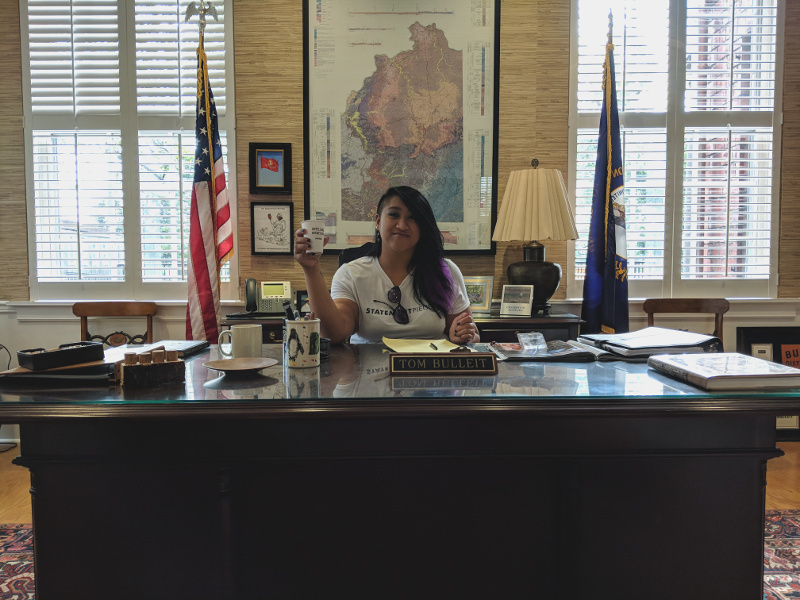 It would ease people traveling with a bourbon enthusiast into the Trail, or serve visitors that want to take in bourbon tourism but not commit to the whole trail. As the last stop on my trip, it was anticlimactic, other than the tour guide's impassioned speech on the boon of downtown improvements and joy in entertaining tourists by sharing some bourbon history. KBT Tip: A receipt from the Evan Williams Bourbon Experience gift shop gets $3 off a Bourbon Heritage Center ticket and vice versa. Additionally, a ticket for the Evan Williams Bourbon Experience is included in a museum package deal, detailed below. Last week, I mentioned that Four Roses has the best deal of the distillery tours. This week, I will share that the best Kentucky travel deal is The Main Ticket for Louisville’s Museum Row on Main. The package is $31.99 ($35.19 with fees) and includes entry to six attractions in downtown Louisville, from distilleries to art museums. For some of them, entry is ~$15 so there is definitely some savings if you’re able to get to multiple locations. Included attractions: Evan Williams Bourbon Experience, Kentucky Peerless Distilling Co., Kentucky Science Center, Louisville Slugger Museum & Factory, Muhammad Ali Center, and The Frazier History Museum. My thought was that if we had even 20 - 30 minutes between tours, poking through a museum would be more enriching than just waiting around. The Main Ticket is good for one year, and valid only for one entry per ticket holder. We only got to half of them, but still considered it worth it. We did have about 25 minutes to wait before our Evan Williams tour time and spent them at the Ali Center. I really, really would have loved to spend more time here. The Ali Center is not only a tribute and educational center for fans of the man and his sport but also brings in new exhibits that touch on issues his life brought to light. For example, there was a photography exhibit focusing on refugees and affecting change on government policy. About two weeks before the trip, it dawned on me that Carrie Underwood defacing her philandering lover’s car in “Before He Cheats” referenced *the* Louisville Slugger bat. I obsessed over this for those two weeks in anticipation for visiting the museum. There was not enough time for a tour but we walked through the museum and watched a short film on baseball history. My Carrie Underwood inspired moment - not smashing the hell out of some jerk’s car but just holding a White Sox game-winning bat! Toy brick model of Comiskey Park…which was US Cellular Field when I was in college…and is now Guaranteed Rate Field. Fun fact: I went to school right across from this baseball field and could sometimes see (and definitely hear) the fireworks from a Sox win! Almost to the Louisville Visitor Center. One of the locations for in-person pick up of Bourbon Trail finisher gifts is the Louisville Visitor Center. The Visitor Center is located in downtown Louisville, only blocks from Museum Row. In addition to Kentucky Bourbon Trail/Urban Bourbon Trail passports and gifts, the Visitor Center also has brochures, maps, souvenirs, and more. Posing by the KFC/Colonel Sanders info stop at the Visitor Center. KBT Tip: The Louisville Visitor Center has Trail passports and the completion stamp/gift. If stopping by the Visitor Center is not an option, the passport can be mailed in and returned with the finisher glass. The tour finisher t-shirt can be bought online as a supplementary finisher gift. Bourbon burnout is real. Getting through ten distilleries in three days is possible in a pinch, but I would not recommend it if you have the time and budget to space things out. Besides the two additional Bardstown distilleries, there is one in Louisville (Old Forester) and one in a town way west of Louisville (O.Z. Tyler in Owensboro) now on the Trail. Getting to Owensboro and timing the trip to one of the (currently) limited tour times will take a day in itself. It may be possible to visit the four Louisville area distilleries in one day, but that would not leave time for much else. There were many other museums, landmarks, attractions, and restaurants I would love to visit in Louisville. I would get the Museum Row Main Ticket again and make sure to visit each of the attractions. And I want my Hot Brown sandwich! Afraid we may not have time for the original from the Brown Hotel, we planned to grab one at Wild Eggs but ran out of time for that too. Other restaurants on my list are Pie Kitchen and Molly Malone’s. I’d also like to shop at Fat Rabbit Thrift & Vintage or ethical fashion shop Baz and Bea Boutique. If you or someone you know is struggling with alcohol or substance abuse, please call SAMHSA’s National Helpline – 1-800-662-HELP (4357). The Substance Abuse And Mental Health Helpline is a free informational service available 24/7.